Sunsets over the Gulf of St. Lawrence are beautiful to sit and watch while camping in Kamouraska, Quebec in Canada. Camping is the only way to travel around Quebec, Canada where you can enjoy the beautiful scenery of the Gulf of St. Lawrence. The Sebka Campground has many sites like this one, with your own picnic table, private surroundings and the view is spectacular. 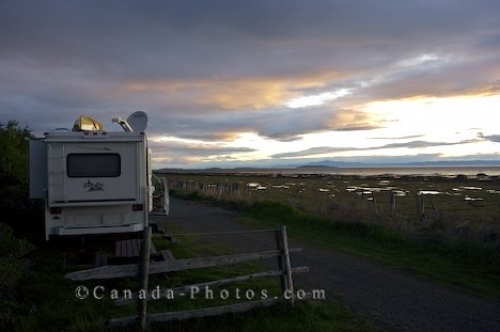 Camper parked during sunset in a camp site at the Sebka Campground on the Gulf of St Lawrence in Kamouraska, Quebec, Canada. Picture of people camping at a campsite at the Sebka Campground in Kamouraska, Quebec overlooking the Gulf of St. Lawrence.